...you buy your Passover matzo a week and a half ahead of the holiday. "We are excited to announce 4 new Wednesday Market vendors... Chicken Bridge Bakery, Farm 42, Farmers' Daughter Pickles & Preserves, & Melina's Fresh Pasta (more details soon!)" Just to clarify, Chicken Bridge Bakery is from Pittsboro and currently sells at market in Carrboro; Farmer's Daughter sells at the Carrboro Farmer's Market as well (click here to see her jams); and Farm 42 is in Hillsborough and sells at the Eno River Market. Was there really no room at market for a income-accessible Jewish bakery that produces less than a mile away from Durham Central Park? Is what we are doing less unique than these vendors? Photo taken of Atwaters market stand at the Dupont Circle Farmer's Market in DC. They must have had at least 300 breads and assorted scones and muffins out for sale. The only other bread/pastry stand there was for Bonaparte Breads, which also had a long line. 1. Ribs at Graffiato were great. They were cooked sous vide, then finished in a wood oven with a light glaze of dill orange yogurt sauce. Tapas style service (i.e. small plates) in any cuisine seems to be taking over the game. 2. I finally had the Shake Shack burger after all the hype. The meat quality was medium. Presentation was very clean, as you would expect from a high-end restauranteur (Danny Meyer). Bun taste was good (buttery) but a little styrafoam-y. Ultimately a smashed burger (like Shake Shack; Wendy's; Five Guys, etc.) is not going to have as much interior umami flavor (i.e. rendered beef fat) as a thicker more traditional restaurant burger. Strawberry shake recommended. The Product: We tried a different version of the cinnamon, brown sugar, and raisin babka this week. Results were pretty good. We made effectively a crumb topping (as with a pie) that was schmeared inside the babka dough prior to its roll-up. Next time, I might modify the recipe - the interior was not particularly full of crumbly delicious sweet chunks of sugar - just kind of like a schmear. The hamentashen were also good. The dough took about four or five trials in the prior two weeks, and I was pretty happy with where we got (Ingredients: Flour, Eggs, Sugar, Shortening, Salt). The filling still needs work -- flavor was good but texture was too crumbly. Cooking poppyseeds into a perfect paste is more difficult than I thought - it is too easy to make it either like a hard candy or like a liquid poppy sugar broth. One of my favorite parts of doing the hamentashen is the crowd reaction. For some, they have never seen it before. For other's, it's "Look Mom, it's just like Moishe's on 2nd Avenue" (literally). One gentleman who purchased the last 10 said he had been looking all over the Triangle for hamentashen with no luck. I was happy we made his day. We complemented our Jewish goods with some Korean kimchi that AR has been working on. Turned out good. Looking forward to more pickles and fermented creations from him. Our awesome customers: Shout outs to EC&SG&SSS, ADK, yoyo&EB, Adam S., A&A, and J&J. Bartering : Adam, our ever reliable contact at Piedmont Biofarm, really went over and beyond the call of duty this week with some foraged Oyster mushrooms. Delicious earthiness, full, meaty chew. Went awesome sauteed over a burger with avocado and Gouda. Also, Bikecoffee seems to have really found their target demographic at the DFM (we bartered a chocolate babka for 2 of their superlative coffees). They were hustling the entire 2-hour block grinding and pouring -- the line at one point stretched fifteen-deep (more on the psychology of lines here). The Crew: Big up as always to RML, SZ, and AR. Sharing sunny market days with you guys is always fantastic. AR helped out this week with the baking and also developed the kimchi (a variant of the Wild Fermentation recipe) which was a great addition for our product line. Big up to RG on the bike delivery route. Also thanks to KG for stepping in for an hour with the hamentashen-forming, green heels and all! Suprise of the weekend: Had the ribs at the Mama Jean's truck outside Fullsteam Sunday. Very good. Would go to their bricks and mortar on Driver St. 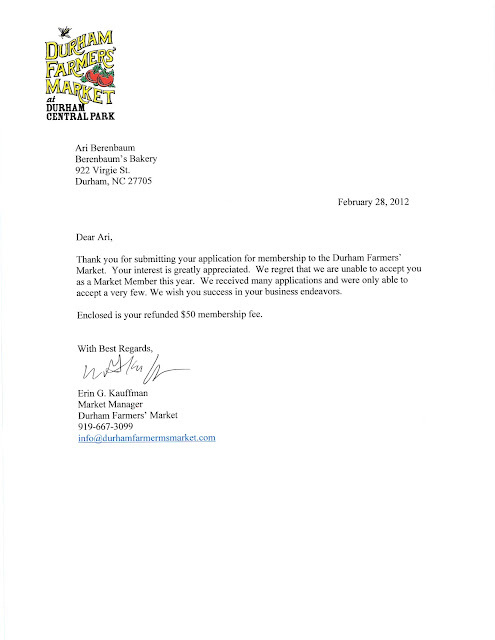 Following up on the DFM: We sent out a letter to the Board asking for more detail on our rejection. I'll be curious to see what we hear. Reliable Cheese Cheese of the Week: Ossau Iraty. The Market receives a large number of applications each year for a very small number of openings. Applicants are considered on a variety of criteria including, but not limited to, uniqueness of product offering, quality of application, dynamics of current market composition, and fit with Market goals and mission. While there are often many great applicants, the final decision is subject to a vote of the Market's Board of Directors. Any further questions may be mailed, in writing, to the Board of Directors. We thank you so much for your interest in Durham Farmers' Market, and wish you the best in your continued business endeavors. If any of y'all know the anyone on the board, please tell them they made a big mistake!